You are here: Home / Drink / Sparkling Bees Knees Cocktail with Caramelized Honey and Tequila ~ more like a bee sting! Sparkling Bees Knees Cocktail with Caramelized Honey and Tequila ~ more like a bee sting! 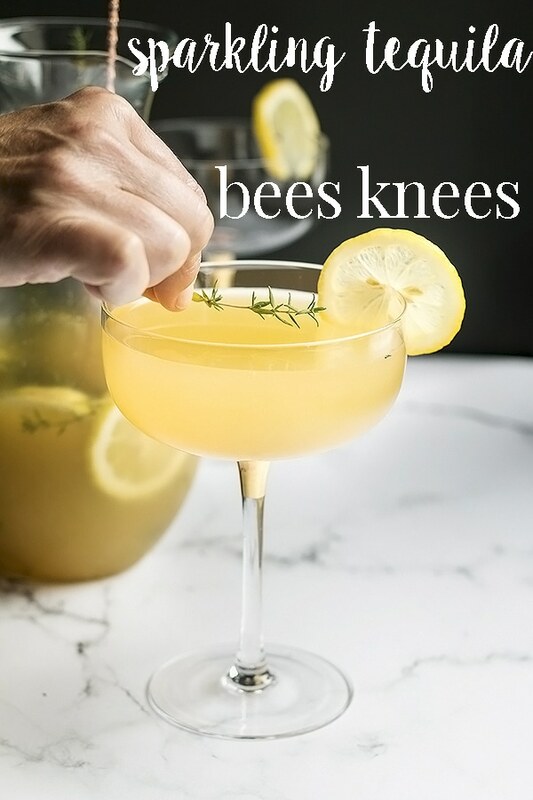 A twist on the classic bees knees cocktail. With tequila and sparkling wine, this honeyed lemon cocktail is more like a bee sting! It’s strong, sweet, sour,bubbly and made in a pitcher so its easy to serve when you have guests. 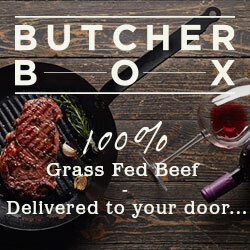 A dangerously good combination! 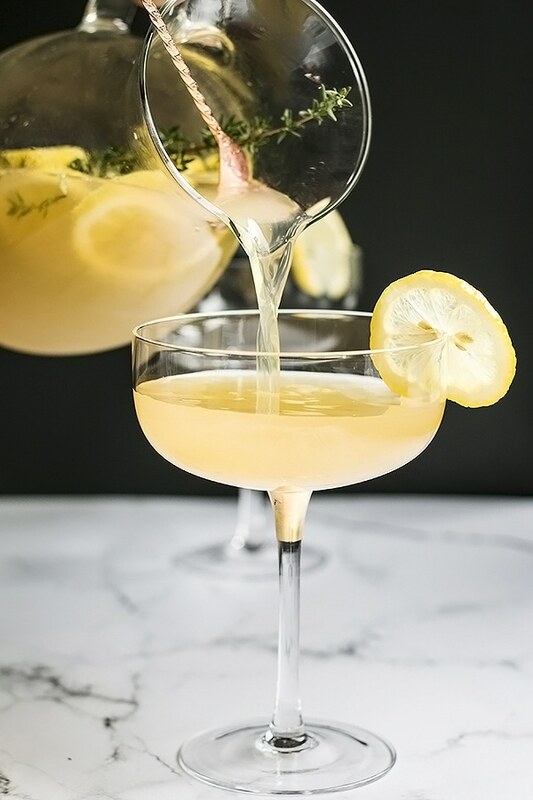 Traditionally the bees knees cocktail is made with gin, honey syrup and lemon. Its a classic sour and its delicious! But Debbie and I love to experiment so we decided to use tequila, a thyme infused caramelized honey syrup, lemon, and a bottle of bubbly. Who doesn’t love a sparkling cocktail? 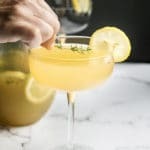 The classic bees knees cocktail is super tasty and they are not hard to make, but unless you have a bartender, its not very convenient to mix one or two cocktails at a time if you are making cocktails for a few people at a time. 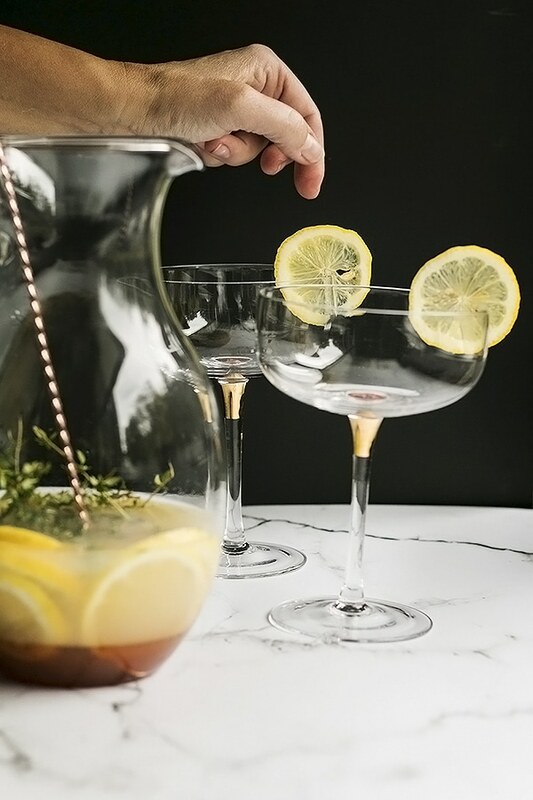 Any cocktail that you can serve in a pitcher, makes things much easier if you are serving guests. This twisted bees knees cocktail starts with a thyme infused caramelized honey syrup. It’s easy to make. 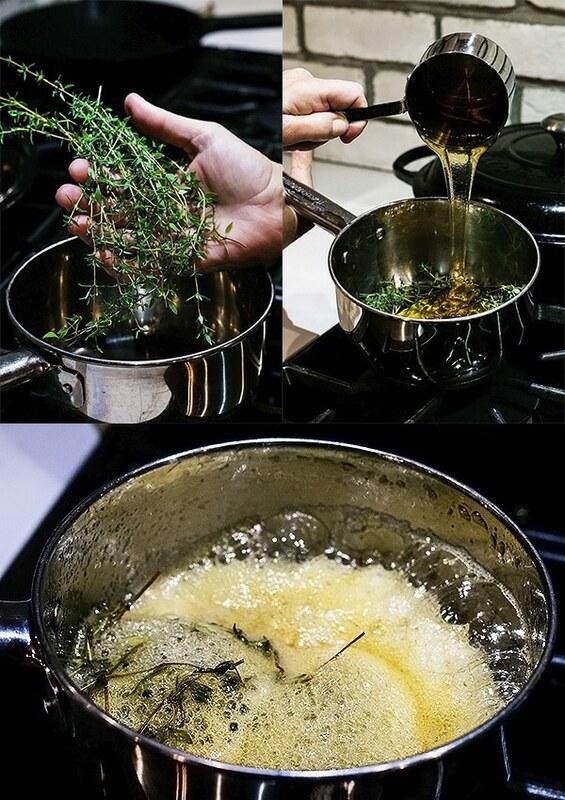 Throw a big handful of thyme in a pot with honey and water and bring it to a simmer. Simmer gently for 10 to 15 mins or until the mixture thickens and turns a beautiful caramel color. You might have to thin it out a little with more water if it gets too thick while you cook it. You want it to be able to mix easily with the rest of the cocktail. Don’t do like we did above and forget to stir it before we added the bubbles lol. We had to stir it after and we lost a bunch of our bubbles when we stirred. Damit! You could also make lots of the tequila, lemon, honey mixture, leave that in the pitcher, then add the sparkling wine to your glass. That way you would be sure to keep the bubbles and if you wern’t drinking the whole bottle at once, you could put the cork back in and preserve as many bubbles as possible. Its alllllll about the bubbles! a beautiful pitcher – this one is great for any cocktail or drink. Especially sangria. Or this crystal cocktail version is awesome too and fancy! A twist on the classic bees knees cocktail. With tequila and sparkling wine, this honeyed lemon cocktail is more like a bee sting! It's strong, sweet, sour,bubbly and made in a pitcher so its easy to serve when you have guests. A dangerously good combination! Add the honey, water, and thyme to a small sauce pot and bring it to a simmer over med heat. Once its simmering, turn it down a bit to medium low and simmer for 10 mins or so until the honey turns a nice golden brown caramel color. Remove from the heat and let it cool. If it gets too thick, you may need to thin it out with a little water. Add some ice to a cocktail shaker and then add all the ingredients except the sparkling wine. 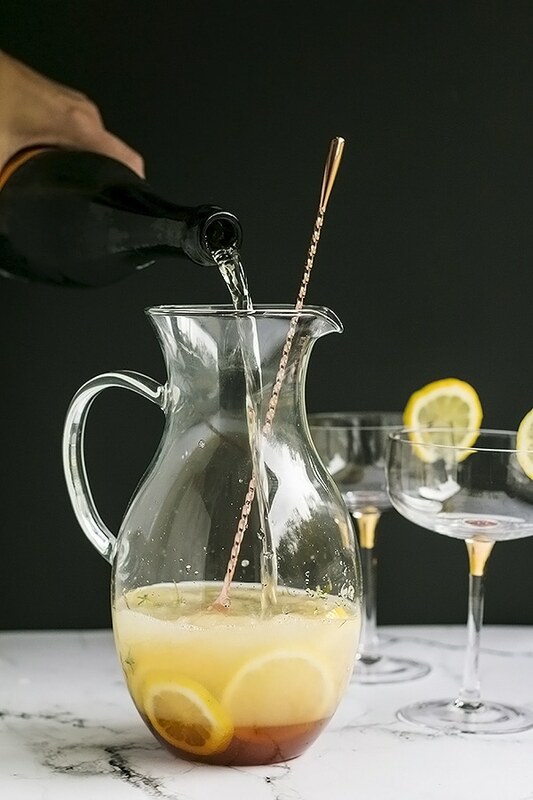 Shake well and pour into a glass then top with the sparkling wine. Add the honey, lemon juice, and tequila to a pitcher and stir well. Add the sparkling wine, stir slightly to combine then pour into chilled glasses. Add some ice to your glass if you like as well.